The legalization of marijuana (cannabis) in certain states has sparked much debate about the potential uses of cannabis and its components, like cannabidiol (CBD), as treatments for various health problems. Many of my patients ask me if cannabis could help to control skin problems like acne, eczema, and rosacea. The bottom line is that we still need to do more research, but there is already plenty of evidence that cannabis can help skin disease! However, until recently, cannabis research has been limited, so we still do not have the answers to many questions, such as which delivery method is the most effective when treating various health and skin problems. However, we do know that cannabis has anti-inflammatory properties and can therefore positively affect inflammatory skin diseases. Cannabis is the plant family that includes both marijuana and hemp plants. THC and CBD are two of the most abundant cannabinoids found in cannabis plants. However, THC is prominent in marijuana plants, while CBD is prominent in hemp plants. THC is the component of marijuana that creates psychoactive effects, or a “high.” CBD does not bind with the same receptors as THC and therefore does not create a high, no matter how much is consumed or used. In 2018 the federal Farm Bill legalized the cultivation and sale of hemp, which lead to a surge of CBD products on the market. Researchers are now working to learn more about the mechanisms behind how CBD affects the body to determine which delivery methods – i.e. oral, topical, or sublingual – work best. How Does Cannabis Help Skin Disease? Many studies have found that cannabis has a wide range of benefits for the skin, particularly when managing certain skin diseases like acne, eczema, and rosacea. We are still studying the best ways to administer cannabis-containing formulas to maximize their effectiveness, but a variety of studies have already proven the positive effects of topical cream containing cannabinoids. A 2015 study published in the Journal of Pharmaceutical Sciences examined the effects of a topical 3% cannabis seed extract cream on the skin. The cannabis seed extract used in the cream was found to have a 79% antioxidant content, offering protection against and repair of existing oxidative damage within the skin, which is believed to be linked with most skin diseases. In addition, this cream was shown to effectively reduce the sebum content of facial skin in study participants, as well as redness. All of these factors, combined with the well-documented anti-inflammatory effects of cannabis, show promising evidence that this plant extract could be an effective therapeutic treatment for acne. The anti-inflammatory effects of cannabis on the skin can also play a role in the management of eczema, given that this common skin disease is caused by underlying inflammation. Additionally, researchers have found that another cannabinoid, called PEA (palmitoylethanolamide), can effectively relieve skin itching (pruritus) and dryness. In a 2010 study, 25 children and 18 adults with eczema were divided into two groups. One group was treated with a combination of a topical emollient containing PEA and a topical corticosteroid. The other group was treated only with the topical corticosteroid. Results of the study found that the group treated with the PEA/steroid combination saw a quicker and more effective reduction of skin itching, redness, and dryness. This group also had a longer period of time in between subsequent symptom flare-ups than the control group. Although we still do not know the exact mechanisms that cause rosacea, we do understand that underlying inflammation is the root cause of its symptoms. While research involving cannabis as a potential treatment for rosacea is more limited than other inflammatory skin diseases, there is mounting evidence that the anti-inflammatory properties of cannabis could help to manage rosacea symptoms, in conjunction with the latest prescription treatments. Expect to see more and more research and exciting findings regarding the link between cannabis and the treatment of inflammatory skin diseases. 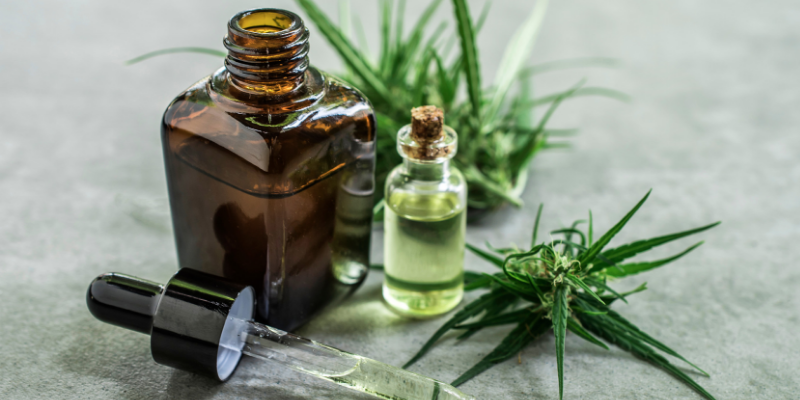 We do know that cannabis and its components, including CBD oil, have strong anti-inflammatory and other beneficial qualities that could help to better manage many skin diseases. To stay up-to-date on the latest news, research, and findings, follow Baumann Cosmetic on Facebook, Instagram, and YouTube, where we’ll post more articles as we find out more information in the near future. Physicians can visit www.STSFranchise.com to stay up-to-date on the latest scientific studies and findings as well.